DO read aloud early and often. Start from infancy, and read aloud every day – even if it’s just for 5-10 minutes! 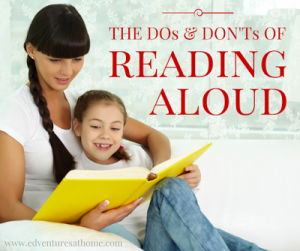 DON’T stop reading aloud just because your kids are growing up! DO choose books that you love to share with your children. Your love of reading and of the story will be contagious! DON’T be afraid to admit it if you made a poor choice of reading material. Give the book a chance, but if you can’t get into it, set it aside. Reading aloud is supposed to be fun, not miserable! DON’T rush! Read slowly and carefully so that your child has time to process the story and enjoy the pictures. DO pause to enjoy the pictures with your child. Point out words and show them how they relate to the images! DO read with expression! Change your tone and inflection for different characters. DON’T be afraid to be silly. Your character voices and sound effects don’t have to be perfect! DON’T be afraid to pause and explain challenging vocabulary or complicated situations. DO admit it if you don’t understand a word or concept. Look it up with your child! DON’T wait to stop reading until your children are tired and bored. DO leave them wanting more… try to find a stopping place with a cliffhanger. They will be excited for your next read aloud session! DON’T leave home without a book! DO read to your kids everywhere – at a restaurant, in a waiting room, while stuck in a traffic jam, while they eat lunch, etc. DON’T feel the need to tie everything back to the curriculum. Sometimes reading is just for fun! DO discuss what you read! Ask your child what they liked about the story and what they disliked. This will help you pick books that pique their interest.